Location: The garden facing the Frank Sinatra cafeteria, the Mt. 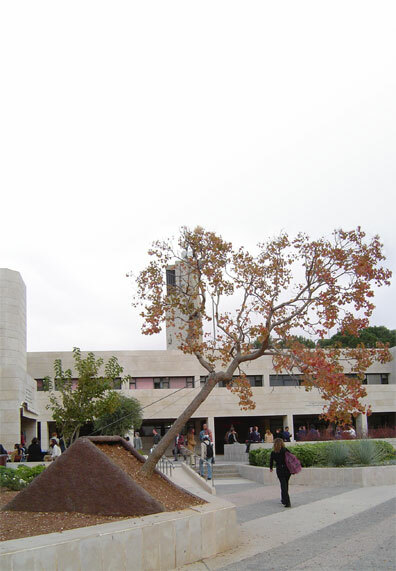 Scopus campus, Jerusalem . Materials: Sapium Sebiferum tree (Chinese Tallow), steel structure covered with expended net, ground stone & pigments, steel cable. December 2002- approval of plans. December 2002- February 2003 transplanting process. February- May 2003 - Installation, development, opening . Key Meanings : Engraving the consequences of the explosion, altered yet continued life, minimal and understated commemoration in contrast to the savagery of the event. Artist Statement : An existing tree was moved and replanted at an angle, as if it had been disturbed by the physical blast of the explosion or by the mental shock, the small earthquake that altered this location. It is a living monument that will change from season to season and regenerate from year to year. Its presence suggests the integration of the traumatic memory into the university's everyday life.